From Collective Inkwell, and the minds of bestselling authors Sean Platt and David Wright (Yesterday’s Gone, No Justice, 12) comes a baker’s dozen bleeding edge tales in “Dark Crossings: The Second Collection.” It’s “Twilight Zone” meets “Black Mirror,” now with the two newest Inkwell authors, Coraline Cole and Sawyer Black. Infinite Doors: Caretaker Claire is trapped in a loveless marriage, weighed down by the loss of her child and playing years of What-If? When a client passes away, Claire is given an opportunity to correct a past mistake, to take the road not taken. But in Dark Crossings, not every door is as it seems. The Box: Dyson is ready to die. His wife and daughter are gone, leaving him alone with an empty, worthless life. All he has left is The Box, and whatever waits inside it. AutoPylot: An experimental new medical technology allows users to set their bodies on auto pilot while their minds drift in a dream state. Jim Therault sees this as an opportunity to finally achieve success. 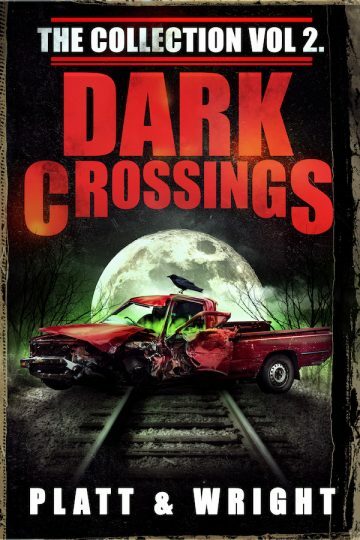 But in Dark Crossings, short cuts will only get you lost. Mr. Kittypuss: H1R-4M held her hand as she died. The woman he’d served for more than twenty two months was gone. Hiram struggles with the loss, fighting seemingly human emotions despite his life as a robot. Awaiting her return even though he knows she’s gone forever. All seems lost until a cat enters his life. And H1R-4M will do anything to protect his new ward. Five Stars: Blogger and food critic Beckett Kennington delivers scathing reviews to the joy of his worldwide fanbase. So when he’s invited to throw his opinion into the mix after his main competitor destroys a local restaurant, how can he say no? But by the end of tonight’s meal, he’ll surely wish that he’d missed it. The Room: There is a room in Jimmy Shire’s house that is always locked. A room that babysitter Taylor is wondering about. What does he keep in there that could be so secret? Tonight Jimmy forgot to lock the door. And Taylor is going to wish she never looked inside. When Boricio Met Rose: Boricio Wolfe (the serial killer from “Yesterday’s Gone”) was just trying to lead a normal life again when he befriends a woman who believes her daughter was murdered by an untouchable man. But no man can escape Boricio’s unique breed of justice. However, just as he’s about to strike, the unthinkable happens — he falls in love. The Road Not Taken: After his father’s recent passing, Randall has been on edge, doing his best to simply get by. But his stepfather thinks he’s lazy and takes matters into his own hands by forcing him to go on a camping trip to help him “become a man.” But after forgetting his medication, Randall ends up on a trip that will change them all forever. The Intruder: Angela hears a noise after waking from a nightmare about her estranged daughter. Her husband, Neil, still recovering from major heart surgery, heads downstairs armed with a closet pole. But what he discovers is far more than a mere intruder. Milgrim’s Legacy: Down on his luck, Keith Franklin gets the opportunity of a lifetime. But what he finds may not be as opportune as he’d thought. He’s left with one choice, and this one decision could cost him his life. Boricio Goes Camping: There’s nothing serial killer Boricio Wolfe hates more than child molesters. When one comes sniffing around Mary’s daughter, Boricio must choose between a) honoring Mary’s request to lay off and b) exacting unholy revenge upon the monster. Spoiler alert: There is no Option A. Hunting: Jane is invited on a luxury vacation with her now famous roommate from college. An all expenses paid trip to an old Scottish hunting lodge. But reminiscing about old times isn’t all that’s planned. Her old friend is harboring a secret that could cost her soul. Rites of Passage: In this standalone side story set in the world of Z 2134, Scout takes her little brother into the woods to teach him how to survive the zombie threat. But what they find will test both of them.